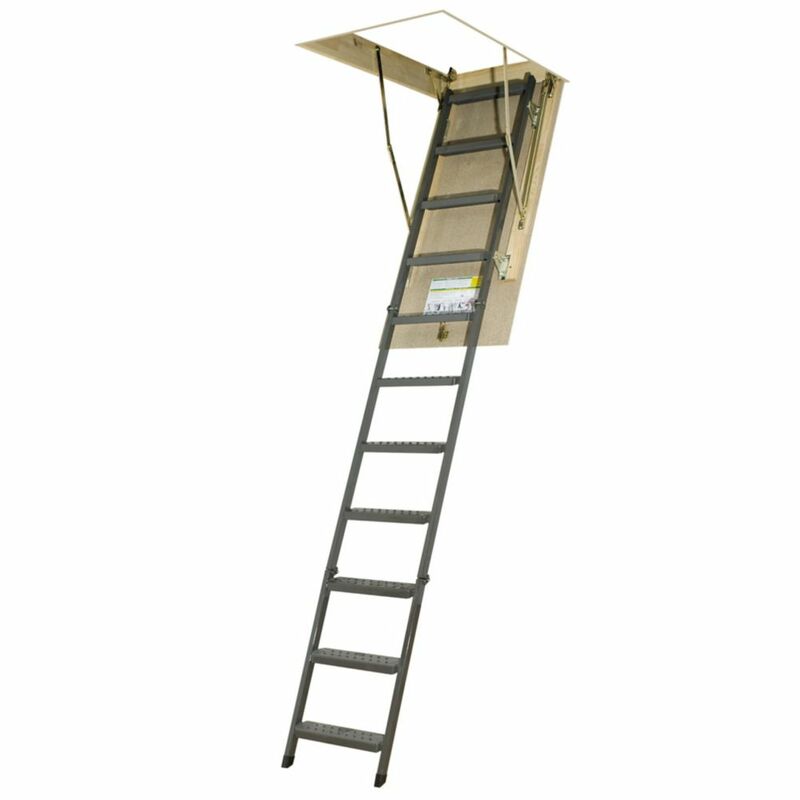 The OWM powder-painted, ANSI approved, metal attic ladder is assembled in three sections. The OWM is equipped with a locking mechanism that is installed inside the door panel. The length of the ladder may be adjusted within 1 inch after cutting the side rails to set the ladder evenly on the floor. The construction of the attic ladder provides more steps (tread rise about 10 inches) to improve safety and comfort. A red, metal handrail is available for purchase and may be installed on either side of the ladder. Brackets allow adjustments to increase space between ladder and attic door for comfort and safety. Springs are located on door surface to make entry to attic wider and more comfortable (the widest entrance on market - compare to other products). Door is well balanced - it opens and closes easily (NO sudden movements). Fits rough opening 22 1/2 in. x 47 in. and ceiling heights 7 ft. 2 in. to 8 ft.11 in. 3/4in. thick hatch, ideal for use in areas where an insulated unit is not needed. Built to protect your stored items in the event of a fire, the Fakro Fire Rated Wood Attic Ladder is EL rated to resist fire for up to 30 minutes. The ladder is also insulated to prevent the loss of heat and constructed from reliable pine wood, with non-slip treads offering safe support when climbing. It can be adjusted to fit ceiling heights from 7 ft. 2-inch to 8 ft. 11-inch and is ANSI certified for safety. Built to keep your stored items safe with a 30-minute fire rating, the Fakro Fire Rated Wood Attic Ladder is constructed from durable pinewood for solid support. Its door is covered with fireproof material and designed to seal when encountering high temperatures. Brackets help increase space between the ladder and attic door for comfort and safety, and the door boast a well-balanced design that opens and closes easily with no sudden movements. The insulated metal LML Lux folds in three segments with the help of a piston handrail. As the ladder unfolds the handrail expands which prevents sudden movements and ensures smooth operation. The LML features deeper steps for safety and comfort of use. An additional top step is included for safer step-up into the attic or loft. Telescopic ladder legs adjusts to the length of the floor, or remove up to two steps. Maximum ceiling height is 10'. Includes an opening rod. Attic Ladder (Metal Basic) OWM 22 1/2 x 47 300lbs 8ft 11in The OWM powder-painted, ANSI approved, metal attic ladder is assembled in three sections. The OWM is equipped with a locking mechanism that is installed inside the door panel. The length of the ladder may be adjusted within 1 inch after cutting the side rails to set the ladder evenly on the floor. The construction of the attic ladder provides more steps (tread rise about 10 inches) to improve safety and comfort. A red, metal handrail is available for purchase and may be installed on either side of the ladder. Brackets allow adjustments to increase space between ladder and attic door for comfort and safety. Springs are located on door surface to make entry to attic wider and more comfortable (the widest entrance on market - compare to other products). Door is well balanced - it opens and closes easily (NO sudden movements). Fits rough opening 22 1/2 in. x 47 in. and ceiling heights 7 ft. 2 in. to 8 ft.11 in. Attic Ladder (Metal Basic) OWM 22 1/2 x 47 300lbs 8ft 11in is rated 5.0 out of 5 by 2.